Stephen J. Raiche is one of the foremost historians on the origins of license plates. His collection of porcelains and pre-states ranks at or near the top of all license plate collections. The quality within his collection is unrivaled. Born in Massachusetts, Steve grew up in Illinois and Missouri and went to college at the University of Missouri. He is devoted to the historical preservation of American culture and the homes and buildings that marked the country's evolution from a wilderness to the pioneer settlements. He has worked in St. Louis, Hartford, Albany, Montpelier, Washington DC and most recently Lakeland, Florida. Simply hanging onto the plates from his cars would make for a good collection for many but he didn't stop there. He located and wrote up the Smithsonian Institution's own collection of license plates, a task that took eight years to complete. One can read about that collection in the April 1996 ALPCA newsletter. He was the chief research historian for the Missouri State Park Board in the early 1970s and curator of the Old First Capital at St. Charles, Missouri. In Washington DC, Steve retired as Director of the City's Historic Preservation Program after 15 years of service. He was named Lakeland, Florida's Preservationist of the year in 2009. He served ALPCA as Third Vice President from 1968-1969 and Second Vice President from 1969-1970. He served as Director from 2004-2005. He was the lead judge of displays at many national conventions and the awards chairman for nearly two decades. He has a natural ability to select award winners and categories that best represent the hobby today. He has written two feature articles on Connecticut plates and two on Missouri plates which have appeared in the newsletter. It is said of Stephen by those who know him best that he is up the earliest and stays out the latest when it comes to hunting those elusive pieces of tin known as license plates. Stephen and his lovely wife Chris were married in Connecticut and now make their home in Florida where she teaches and he is a preservationist contractor. 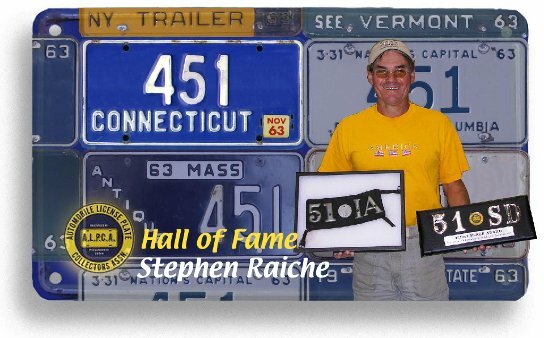 The ALPCA Hall of Fame is proud to welcome Stephen J. Raiche to its ranks and grateful for his efforts over the years in preserving the history of our hobby.